In Savage Lane, Jason Starr has crafted a searing tale of suspense that proves the adage: Love thy neighbor, but don't pull down your hedge. Karen Daily, recently divorced, lives with her two kids in a quaint suburb of New York City. She's teaching at a nearby elementary school, starting to date again, and for the first time in years has found joy in her life. Mark Berman, Karen's friend and neighbor, wants out of his unhappy marriage, and so does his wife, Deb, but they have stayed together for the sake of their children. 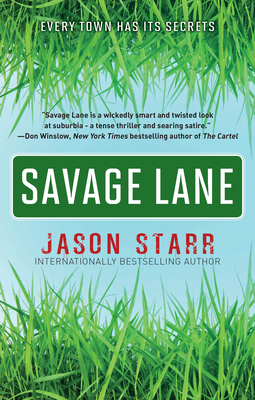 Jason Starr is one of our most accomplished writers of the darkness that lies within the human heart, and Savage Lane is his most riveting and intimate novel yet--a dark, domestic thriller and an honest, searing satire of a declining marriage, suburban life, and obsessive love. Jason Starr is the internationally best-selling author of many crime novels and thrillers, and his books have been published in over a dozen languages. He has also cowritten several novels with Ken Bruen for Hard Case Crime, and his work in comics for Marvel, D.C, Vertigo, and Boom! Studios has featured Wolverine, The Punisher, Batman, Doc Savage, The Avenger, Ant-Man, and The Sandman. Many of his books are in development for film and TV. Starr's best-selling crime novels include Nothing Personal, Hard Feelings, Tough Luck, Twisted City, Lights Out, The Follower, and Panic Attack. He is one of only several authors who have won the Anthony Award for mystery fiction multiple times. He was born in Brooklyn, NY, and lives in Manhattan, NY.